Happy Monday! I hope you are having a fabulous day! I wanted to share this gift box I altered using a wooden box found at my local Michael's store. 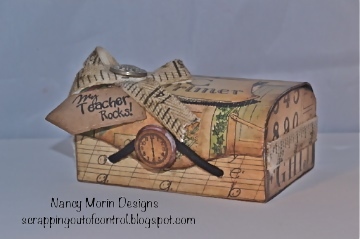 I covered the box using the Graphic 45's Primer Paper Collection. For my sentiment, I used MCT My Teacher Rocks Stamp Set. I think this would make a cute end of the year gift for my daughter's teacher. What do you think? Please let me know if you have any questions about this project. 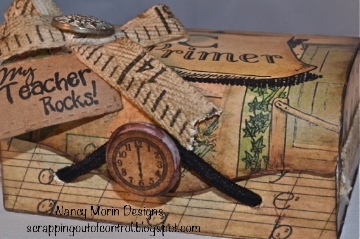 Nancy ~ What a GORGEOUS box! I LOVE how vintage it looks! The ribbon andpapers are just so BEAUTIFUL together! Love it! 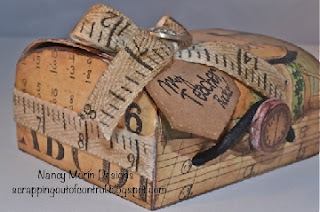 Really cute box my friend.